Annie has a secret. But if she’s not going to tell, we won’t either. It’s a heart-breaking secret she wishes she didn’t have – yet Annie isn’t broken, not quite yet. Especially now there’s someone out there who seems determined to fix her. Kate has run away. But she’s not going to tell us why – that would defeat the point of running, wouldn’t it? It’s proving difficult to reinvent herself, however, with one person always on her mind. Scratch beneath the surface and nobody is really who they seem. Even Annie and Kate, two old friends, aren’t entirely sure who they are any more. Perhaps you can work it out, before their pasts catch up with them for good. 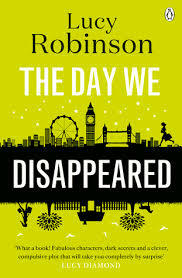 This was my first novel I have read by Lucy Robinson and OMG WOW what a Novel It one of those books where you finish it last week and its still on your mind 7 days later. The Story is splendidly told and very well written. I really enjoyed that each chapter was set in alternative chapters between Kate and Annie with little cliff hangers at the end of each chapter which forced you to keep going to get more information and try to piece the jigsaw together. The twist in the story totally blew me away I did not see it coming and still thinking about it now. So VERY clever. This was a gripping and a very exciting read.